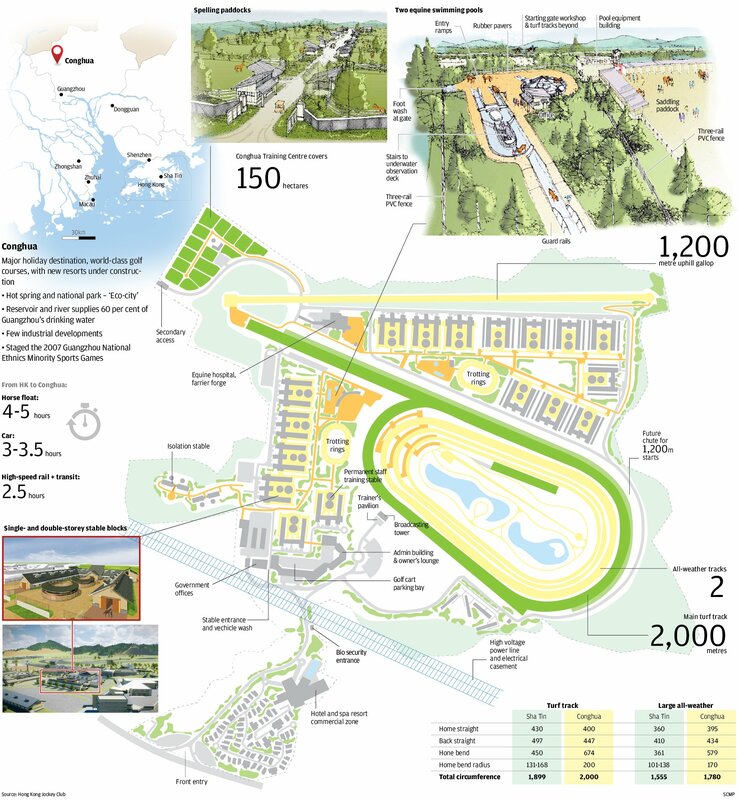 Called “crazy” for its vision to internationalise Hong Kong racing, the Hong Kong Jockey Club has taken “craziness” to a whole new level with its HK$3 billion investment in the Conghua training facility near Guangzhou. Hong Kong Jockey Club chief executive Winfried Engelbrecht-Bresges said the Conghua complex was a strategic investment to benefit Hong Kong racing – and a potential footprint if there was a shift towards a racing industry, with betting, in mainland China. The facility was also crucial in allowing major renovation work to start at the ageing Sha Tin complex, which will cost HK$1.5 billion. “The portfolio of a renovated Sha Tin and Conghua will be a much better platform to take Hong Kong racing to the next level, and will position us uniquely if, for example, a sizeable breeding industry would be developed in China, or changes in racing policies in China would materialise,” Engelbrecht-Bresges said. The Conghua facility covers 150 hectares – twice the size of the Sha Tin complex – and is being built in a special equine disease-free zone in a mountainous area known for hot springs and future eco-tourism. Due to open in July 2018 after construction delays, including a landslide, it is a result of the HKJC’s close relationship with mainland authorities. The club staged the equestrian events of the 2008 Beijing Olympics at Sha Tin and built the equestrian facility for the 2010 Guangzhou Asian Games, on the same site at Conghua. “A lot of people were extremely sceptical when we started the internationalisation of Hong Kong racing, especially the international races, and said it was a waste of money, something that was not beneficial to Hong Kong racing. At that time, the additional costs were about HK$120 million a year for having a real international racing product,” Engelbrecht-Bresges said. “A lot of people were thinking it was crazy, not worth the money, but now I think people see it was probably the best investment we could have made to ensure long-term sustainability and the worldwide branding of Hong Kong racing. “And with international racing you see now the real benefits. The first small benefits were through simulcasting but we see now with commingling. We have an average of HK$50 million-HK$60 million coming from overseas every meeting, which is around 3 per cent of our turnover and I’m convinced it will grow to as much as 8 or 10 per cent,” Engelbrecht-Bresges said. The Jockey Club last season saw a 1.8 per cent growth in racing turnover to HK$107 billion. Together with soccer betting (up 10.9 per cent to HK$86.8 billion) and Mark Six (up 9.9 per cent to HK$8.55 billion), its overall turnover hit HK$202.7 billion (up 5.88 per cent). It paid a record HK$20.9 billion to the government in duty and profits tax and handed out HK$3.87 billion to charities and HK$1.28 billion to the Lotteries Fund. Engelbrecht-Bresges said they had tried “for many years” to acquire land in Hong Kong for a new facility but space was not available. “And it is not available in Shenzhen so that’s why it is necessary to be where it is. The opportunity we had, to take up this land after the Asian Games does not come along every day. “It is perfect for what we require and an environmentally protected area. If you look at the problems they have now in Australia with coal mining in the prime breeding region of the Hunter Valley, that is something we wanted to avoid.